The Crooked River National Grassland office, in the chamber building in Madras, now offers permits. It's never too early to get into the Christmas spirit! 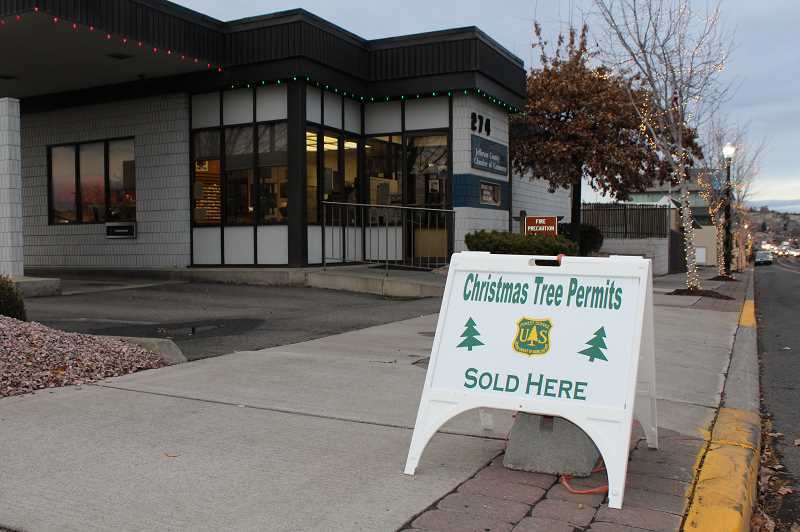 Christmas tree permits can now be purchased or redeemed at Deschutes and Ochoco National Forest offices. Individual Christmas tree permits are $5 each and can be purchased or redeemed on weekdays from 8 a.m. to 4:30 p.m. at the Deschutes or Ochoco Supervisor or District offices and a number of Central Oregon retailers. Additionally, National Forest offices in Bend, Redmond, Madras and Prineville will be open on a few select Saturdays between now and Christmas. On Dec. 8 and 15, visitors can visit the Crooked River National Grassland office at 274 SW Fourth St. in Madras from 9 a.m. to 1 p.m., or the Deschutes National Forest headquarters at 63095 Deschutes Market Road in Bend from 10 a.m. to 2 p.m. to purchase a permit. The Ochoco National Forest headquarters at 3160 NE Third St. in Prineville will be open Dec. 8, 15 and 22, from 9 a.m. to 1 p.m. to purchase Christmas tree permits. As always, permits are also available at several commercial outlets across Central Oregon. Each household can purchase a maximum of five permits. For the fourth year in a row, Smokey Bear and Santa Claus are teaming up to bring some special holiday cheer to fourth-graders across the country. As part of the national Every Kid in a Park initiative, the U.S. Forest Service is excited to announce that all fourth-graders are eligible for a free Christmas tree permit from their local national forest. In order for students to receive a free tree permit, they must present a valid paper voucher printed from the Every Kid in a Park website. First, visit www.everykidinapark.gov and follow instructions to obtain the paper voucher. Print out the paper voucher and take it to a National Forest office to claim the free permit. Additional information and a list of retailers can be found online at go.usa.gov/xPGgd. As a reminder, weather conditions at higher elevations can be dramatically different from local conditions and visitors should be prepared for cold and unpredictable weather. Additionally, most forest roads are not maintained for winter driving, so snow patches or debris may be encountered. Take a hand saw or axe, as well as winter clothing and safety equipment. Tire chains and a shovel are recommended, as is extra food, drinking water, blankets, a flashlight, first-aid kit and survival gear. Tree cutting and travel can take longer than anticipated, and individuals are encouraged to notify a friend or family member of the anticipated destination and to leave the woods well before dark. To keep a tree from drying out and becoming a fire hazard, leave it outside until you're ready to move it indoors. Cut the trunk at an angle before placing it in the stand and remember to refill the stand's reservoir daily.